In a minute or two of trawling around LinkedIn you will be amazed at the great men who all sing the praises of failure: from Churchill to Michael Jordan; from Kennedy to Henry Ford; from James Joyce to Abraham Lincoln. On the other hand, you won’t read much about Joe Dorn, a baker in Pocatello, Idaho, who had to close his bakery in 1913 and never got over it. So what’s the lesson here? Well, we admire the great men who rebound and couldn’t care less about all the others. Rebound makes the difference—which is nothing new to Michael Jordan! 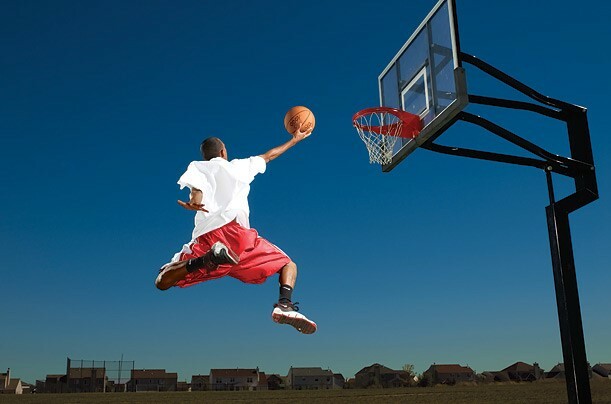 Furthermore, unlike balls, human beings can rebound even higher than where they started from before the fall. So how about this, failure is great so long as it doesn’t last forever. But how can we be sure it’ll be just a passing thing? Given the crisis, the competition and the endless transformations our clients face, we have had to start thinking about this subject. You can’t adapt without innovation; you can’t innovate without failures; and you can’t rebound or be successful without accepting failure. However, failure isn’t always recognized or accepted for what it is: not a source of shame, but an unavoidable by-product of risks inherent to innovation. How can we help teams perceive failure as a necessary ingredient of progress and a trigger for rebound? Who hasn’t had his/her share of failures? But let’s not confuse everything: failures and mistakes are not the same thing even though failures generally occur after a series of mistakes for whatever reason. Failure is the final collapse of an initiative. So the more we have initiatives, the more we increase the probability of failure. All these companies who want to become so innovative have to realize this. So now they face a dilemma: how can we run after innovation if we don’t accept failure—or, even more failures? We don’t need to extol the virtues of failures, but we do need to acknowledge that they can be the source of critical learning. This is a problem in the international corporate world that runs along what Philippe d’Iribarne calls “the codes of honor.” That’s about making it the first time round. The first time! And this leads people to discredit failures or, even worse, to push them under the rug and so learn nothing from them. Start-ups undoubtedly have a more realistic approach given that, at least statistically, failures in that context are far more likely. We have observed our own failures and those of our clients, and explored what has made it possible for us all to rebound. The critical point is how we manage emotions during this time. We identified a fairly straightforward journey that can pull us out of the failure that has weakened our resilience. This journey follows what we call the Emotional Compass©. Anger surges at the moment of failure. Nothing’s working as it should and we grow angrier by the minute. It’s a very “active” process. You’ve seen a teen-ager fling his/her joystick against the wall because s/he hasn’t made it to level 3 in the game. Well, that’s it! Anger is the sister of powerlessness, and powerlessness, whatever the cause, triggers anger. When we feel angry, it’s sometimes wise to do nothing—to let things calm down, they say. At best, we can try to channel our anger and move on to something else, and thus restrain it. In all cases we have to accept it. Anger is normal but hopefully only fleeting. Sorrow is the passive version of anger and often follows right on its heels. Sorrow wallows in disappointment and depression; in wanting to give up on everything; in losing energy. Sorrow needs solidarity. For teams that have been weakened by anger this is the time to gather together so that each team member can draw on the collective energy of the group. This shared moment is both emotional and an intellectual and contains the seeds of rebound. Satisfaction grows out of analyzing and understanding what happened. It’s an analytical process, without a priori judgments, and explored the errors and weak points that led to failure. Once this has been done, the team feels a sense of satisfaction. Team members share understanding and feel more in control of the new situation. Anger alone too often leads to finger pointing and destroys the solidarity needed for rebound. Here, we only judge purposeful errors. For the rest, we evaluate and apply gap analyses. We could have called this last stage Enthusiasm, but Joy is far stronger. In addition high energy, Joy evokes the individual and collective smiles on the faces in the team as people begin to see solutions and start moving forward once again. Joy is the sign that the team is rebounding and that failure has been fruitful. Given the crisis, ICM has been working with our clients on team resilience and team ability to rebound in critical situations. To rebound ever higher, of course. We’ve used this model as the basis for a workshop on how to develop the ability to rebound. The tools we use with teams and leaders all explore how to move forward and be successful together when the seas are rough. 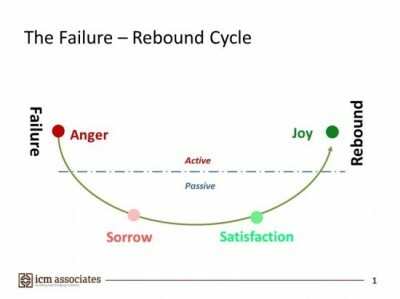 And how to transform failures into lessons for rebound.